Wear your green and celebrate St. Patrick's Day in downtown Claremore during the city's St. Paddy's Party, where even the local statues of Will Rogers get decorated for the holiday. St. Patrick’s Day is a time to celebrate the luck of the Irish with parades, festivals, the clinking of beer glasses and good, old-fashioned frivolity. Whether you’re searching for ways to honor your Irish heritage or merely look good in green, Oklahoma has a St. Patrick’s Day bash for you. Read on to discover Oklahoma’s top Irish pubs, restaurants and even family-friendly options where you can celebrate the legend of St. Patrick in style. Located just minutes south of the Oklahoma City metro area, the college town of Norman knows how to throw a St. Patrick’s Day bash. At O’Connell’s Irish Pub & Grille you’ll find a lively atmosphere where anything goes. Karaoke, limitless brew and live music are the staples of this college crowd hotspot, where pints, pitchers and colossal “rockets” of bold Irish stouts like Guinness or Smithwick’s are served up to crowds of party-goers on St. Patrick’s Day. Live music, food specials and vendors get the celebration started, while pints of Guinness, glasses of single malt scotch and shots of Irish whiskey keep it going until 2am. To pay tribute to Irish culture without the rowdy crowds, head to Saints in Oklahoma City. Located in the trendy Plaza District, visitors will be treated to perfectly prepared Irish dishes like lamb and barley stew and the O’Patty loaf sandwich in an upbeat, modern atmosphere. Tap into their extensive whiskey collection and unwind to the jukebox’s tunes. Tulsa’s energetic Blue Dome Entertainment District turns a vibrant shade of green every year when the streets are filled with thousands of spectators sporting the traditional color. Home of longtime Irish favorites Arnie’s Bar, Woody’s Corner Bar and James E. McNellie’s Public House (check out their OKC outpost as well) within a few blocks of one another, festival-goers will be treated to enough Irish beer and fare to feed a small army. Held throughout the entire St. Patrick’s Day weekend from morning until night, visitors can pub crawl, browse fun local retailers or enjoy live music all weekend long into the early morning hours. Wander through the five-block radius in the Blue Dome District that will be blocked from traffic and watch as the party spills out onto the streets with tent staging areas and bar stands with rooftop seating. Keep an eye out for McNellie’s semi-truck featuring 30 taps and over 100 kegs of beer. No Tulsa celebration of St. Patrick’s would be complete without a visit to Arnie’s Bar, T-Town’s most famous Irish-themed pub. With no cover charge all weekend, live music scheduled each evening and everything from Guinness and Harp, to Smithwick’s and Killian’s Irish Red on tap, Arnie’s is the place to be. While celebrating at this cozy hangout, don’t forget to try your hand at a game of shuffleboard, throw a round of darts with friends or make your way to the outdoor patio. As an added bonus, all St. Patrick’s Day beer is served in a 22 oz. souvenir cup. Head over to Tulsa’s trendy Cherry Street area for one of the city’s biggest St. Patrick’s Day blowouts at Kilkenny’s Irish Pub. Dine on Irish fare such as beer-battered fish and chips, corned beef and cabbage or potato soup, before heading outside to join the festivities under Kilkenny’s party tent. Live music, food specials and vendors get the celebration started, while pints of Guinness, glasses of single malt scotch and shots of Irish whiskey keep it going until 2am. 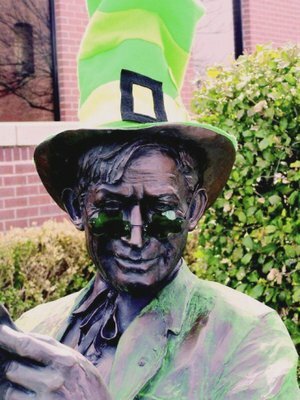 Even Will Rogers gets dressed up for the St. Paddy’s Party in Claremore, located a short 30 minutes from central Tulsa. Visit the downtown area where green-clad spectators will be treated to live music from a Celtic band and traditional Irish grub like bangers and mash. The whole family will enjoy Claremore’s shortest parade, and the little ones will have a chance to partake in some festive face painting. Although there is no official St. Paddy's party in the almost abandoned town of Shamrock, this unique town deserves a celebration on St. Patrick's Day. Take a road trip to this eerie ghost town, which boomed around 1913 when the Cushing Oil Field was discovered. Oilfield workers created a rowdy town full of saloons, gambling halls, hotels and brothels before they began to move along to new boomtowns in the mid-1920s. Shamrock made headlines again in 1932 when famous outlaw Pretty Boy Floyd robbed the local bank. Visit the sleepy town to see the old-fashioned businesses and Irish customs left behind almost a century ago. No matter which St. Patrick’s Day celebration you choose to attend, if you decide to toast your inner Irishman with an alcoholic beverage, please remember to celebrate responsibly. Sláinte!